The mystical power of the Everdark is rising, and even the greatest heroes of Terrinoth are not immune to the corruption that comes with it. Countless innocents have been pierced by shards of Everdark that transform them into mindless servants of evil. 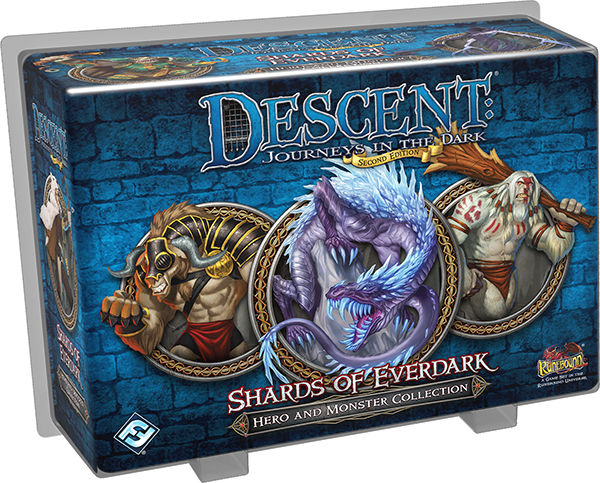 Terrinoth faces a mighty threat, and you alone can stop it with the Shards of Everdark Hero and Monster Collection for Descent: Journeys in the Dark! Following in the footsteps of previous Hero and Monster Collections for Descent, Shards of Everdark introduces four heroes from the game’s first edition, breathing new life into them with revitalized artwork and figure sculpts. 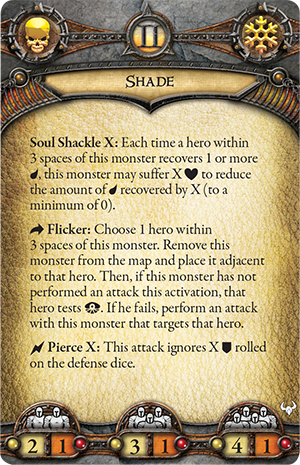 In the same way, two monster groups from the first edition rejoin the game, as well as an entirely new monster group—the dark minotaurs, which we revealed in our previous article..
Today, we want to take the time to preview another hero and a monster group from Shards of Everdark: Arvel Worldwalker and the shades. Shards of Everdark contains four heroes, two dark minotaurs, two ice wyrms, and five shades. Arvel’s mother was a Worldwalker, as was her mother before her. In fact, Arvel belongs to a heritage that extends further back than any living being can recall. Filled with a wanderlust that even nomadic tribes consider extreme, Worldwalkers like Arvel leave their homeland when they are very young, eager to explore the world as no others can. Each generation builds upon the experiences of the last: ever changing, ever growing. Inevitably, Arvel’s wanderings have brought her into contact with great evil, and now she pauses in her travels to take a stand against the power of the Everdark. 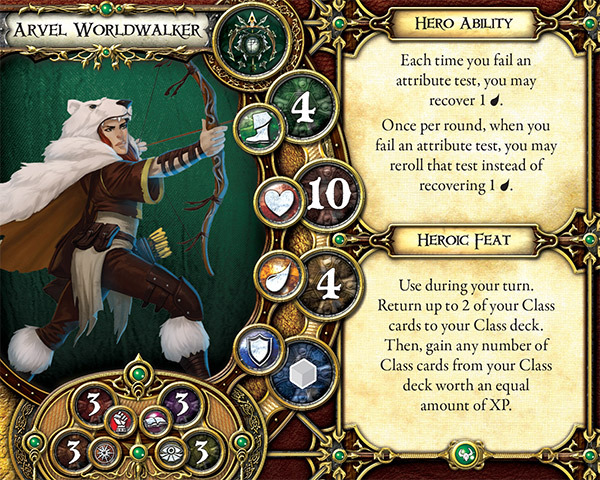 Arvel Worldwalker’s travels have taught her to be adaptable, and these attributes can serve you well if you choose to include her in your hero party. First, you’ll find that attribute tests do not easily faze Arvel. All of Arvel’s attributes are balanced, giving her an equal chance of succeeding at any test, and her hero ability directly relates to attribute tests. Whenever Arvel fails an attribute test, you can immediately recover a fatigue, giving you more options for moving and triggering special abilities. Alternatively, you may choose to reroll the attribute test instead of recovering fatigue—no matter what you choose, Arvel can adapt to seize the advantage in any situation. Furthermore, Arvel boasts a heroic feat that goes far beyond the bounds of nearly every other heroic feat; in fact, it allows her to completely reinvent herself in the middle of a quest. You can use Arvel’s heroic feat on your turn to return up to two of your Class cards to your Class deck. Then, you can gain any number of Class cards from your deck worth an equal amount of XP! Essentially, this gives you access to nearly your entire Class deck throughout a campaign and helps you tailor your hero to fit any situation you encounter. Arvel Worldwalker boasts a vast knowledge of the world, but even she would be hard-pressed to determine the origin of a shade. Whether they’re lost souls desperate to find rest or the lingering energy of powerful magicians, these spirits are mere shadows of the lives they once lived. However, should a shade linger long enough or find purchase on a source of dark power, it quickly evolves into a more formidable foe. Heroes have learned to banish shades quickly—or suffer their wrath. As servants of the overlord player, shades can be some of the most subtle and dangerous enemies faced by the heroes. First of all, shades are relatively fast and come in large numbers: if four heroes are playing the game, they’ll be pitted against five shades. The ephemeral nature of a shade also gives it an advantage in battle, allowing you to roll a black defense die against every attack or spend surges to pierce mundane armor. The shades’ ghostly nature can also give them an edge when they’re preying upon the heroes. All shades have access to the Flicker ability, allowing them to warp next to a hero and attack if the hero fails an awareness test. You can also prevent heroes from recovering fatigue by draining their life with the Soul Shackle ability. You can activate this ability whenever a nearby hero attempts to recover fatigue, and in exchange for suffering some damage on your shade, you can keep an equivalent amount of fatigue on the hero! Ultimately, recovering fatigue gives the heroes more options, and the more you’re able to restrict those options, the further you keep the heroes from their objectives. The power of the Everdark is ascendant in Terrinoth. With two brand-new quests introduced in Shards of Everdark, you decide whether you support the Everdark or seek to tear down its corrosive influence. 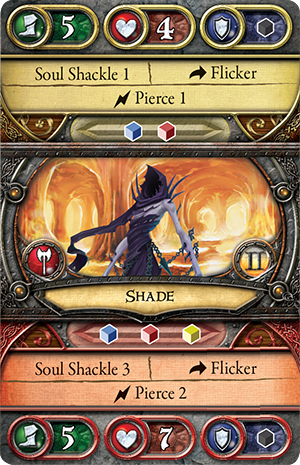 Stay tuned for more previews and pre-order your copy of Shards of Everdark at your local retailer today!